ULTRA SOUND AMP SALES specializes exclusively in the expert sales and service of the finest High-End, Boutique, Vintage and Very Rare amplifiers, speakers, cabinets, and tubes. We have the world's largest selection and at Ultra Sound you will always receive personal attention from our two amp experts who will assist you in finding your dream amplification setup. Gene and Ken will make this highly individual process a rewarding experience that is both fun and educational. Using your input they will carefully guide you until you find the right amp, cabinet and speakers that are a synergistic match to each other and your playing style. We are committed to helping you realize the guitar tone and feel you have always envisioned - sound that moves you so strongly that it inspires both your playing and creativity. Our dedication to each client combined with our vast expertise and experience really make the difference and your complete satisfaction is always our primary goal. Clients have said Ultra Sound "Is Tone Heaven" and "Is Truly The Playground Of The Tone Gods". No matter where you live there are many reasons why Ultra Sound is your best choice when you are looking for your perfect amp with the tone you have always dreamed of. WE KNOW BENCHMARK TONE. Ultra Sound has one of the largest collections of very rare and superb boutique amps that are considered to be the "tonal references" by which others are judged. We own original Trainwreck, Dumble, Bruno, Komet, Matchless, Victoria, DR Z, Cornford, 3 Monkeys, Alessandro and many more. Also included in our collection are iconic late1950s and 1960s amps including Marshall, Vox and Fender as well as vintage Marshall cabinets with Celestion speakers that have the "Holy Grail" Pulsonic speaker cones. Many recording artists and amp enthusiasts have purchased rare and boutique amps and cabinets from us over the years because of our experience and expertise. We sell, set up, service and rent amps to many of the best players including New Old Stock tube upgrades, speaker cabinet or speaker upgrades, amp voicing, speaker aging, amp modifications, etc. WE SELECT THE BEST AMPS. Ultra Sound carefully selects the finest sounding amp brands based on tone, build quality and value. The builders we represent are considered to be among the very best and their amps have all the elements that make them musically superior including superb tonal balance, harmonic complexity, articulation, touch sensitivity and dynamic response. We are constantly on the lookout for great new amps and we audition many new brands, but only the very best make the cut to be included in the amps we offer to our clients. WE SERVICE WHAT WE SELL. Ultra Sound offers high quality service to every client who purchases an amp from us including repair, replacing or upgrading tubes, biasing, voicing, etc. Any repair work is done to the original manufacturers' specs using the original manufacturers' parts. We use the finest new tubes available when replacing tubes and we can also offer the finest rare New Old Stock tubes for our clients who want the very best. (1) A free loaner amp of the same model that you may keep until your amp is fixed, if your amp ever needs repair. (2) You may purchase replacement tubes from us for your amp at much less then the price at a music store. These are the finest new tubes available including Sovtek, Electro Harmonix, Ruby Tube, TAD, JJ, etc. All tubes are carefully tested and power tubes are precision matched within 1 ma plate current, which is closer than any factory match you can buy. (3) We are here to help you with any questions including cabinets, speakers, tubes, cables, voicing, biasing, etc. Our vast knowledge, expertise and experience is only a phone call or email away and is complementary to our clients. WE REALLY KNOW OUR AMPS. At Ultra Sound, we carefully play, tune, voice and service the amps and speaker cabinets we sell. In addition, we put them through extensive testing and try every possible tube and or speaker type that you can imagine with various guitars. We really listen to what our clients say as they test or play the amps with their bands. All this gives us a lot of valuable info in terms of what players like, what each amp is really capable of, and how well they hold up. Lastly, Gene and Ken work in conjunction with several of the elite amp builders on exclusive models with custom features. THE ULTIMATE AMP AUDITION EXPERIENCE ON EITHER COAST. We have professional music studios in both New York City and Vista California so when you are ready to play some of the best high-end guitar amps on the planet, contact us to set up an appointment. We will give you the personal attention that you deserve. We start out by asking a series of questions to determine what type of amp will best suit your needs. Then we start the audition process. The music studios we use for amp auditions are acoustically designed and tuned. There are no standing sound waves or sonic inconsistencies to confuse your ears. In other words, the rooms are "Flat " and it is a perfect environment for testing the amps against each other. There will be no surprises when you play the amp of your choice in your own environment. In addition, you get your own private studio. You can play as loud as you like and there are no distractions from anyone playing right next to you. THE EXTRA MILE. Once you narrow it down to your dream amp, we will spend more time discussing various options as in the configuration, the colors, the speaker choice, the tube choice, and more. If we do not have that specific amp in stock then we will custom order it for you. At that point, if needed we will give you a loaner amp to use while your amp is being built. That way there is no down time and you will have an amp to gig and play with that same day. If we have the amp in stock, you can take that home with you or we can ship it to you. We also offer a 14-day trial period. If you decide that the amp isn't quite right for your needs, then you can exchange it for any of the other 200 plus amp models that we stock. Only a small restocking fee and any applicable shipping charges will apply to your exchange. Our thinking is this, since we carry just about every great amp made, then it's just a matter of finding out what your hands and your ears like. Our goal is to work with you to find your perfect amp even if that takes longer. 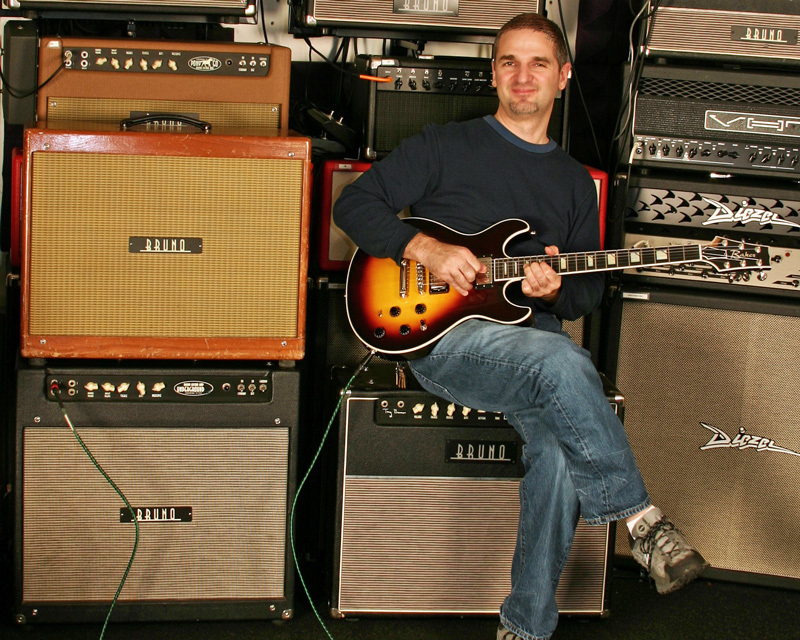 Ken Volpe doing an amp demo of several Bruno Custom Amps for a client. IF YOU ARE FAR AWAY. Then you have all the more reason to work with us. We can guide you to your perfect "keeper" amp because we have hands-on experience with the very best amps in the world. We understand the subtle differences, we have experienced ears, and we have the opportunity on a daily basis to hear players just like you, A/B test our fine amps. We have a close and personal relationship with many of amp builders, a more than passing familiarity with amp design, and a true devotion to making the right match between player, guitar, amp, and speakers. You can call us 7 days a week to receive personal attention to discuss your amplifier needs. We will spend as much time as needed by asking you a series of questions about your amplifier requirements. By using our extensive amp knowledge and our in depth discussions with you, we can help you make a well-informed decision so you get your perfect amp. To assist in the decision process you can listen to amp sound samples for many of the models on our website. Then if you need even more sonic information we can send you a free amp demo CD to help you zero in on the tone you really like. Instead of wading through opinions based on limited experience, let us share our solid time tested knowledge to help you make the choice that's right for you. Over the years we have helped hundreds of clients find their perfect amp setup with the tone and feel they had always dreamed of even when they were thousands of miles away. We can do the same for you.